"We came here and we were brave. We went with three centre forwards and wanted to have a go at it and cause them problems. "If you look at our performance, as a Wimbledon fan or part of the group, you'll see that they haven't had an attempt or troubled James Shea and we've had the best two chances of the game. "To play three forwards and draw 0-0 is strange, but the boys have put in a fantastic shift after five games in two weeks." Attempt missed. Joe Riley (Oxford United) right footed shot from outside the box is close, but misses to the left. Attempt saved. Alfie Potter (Oxford United) right footed shot from the left side of the box is saved in the bottom right corner. Tareiq Holmes-Dennis (Oxford United) wins a free kick on the right wing. Corner, Oxford United. Conceded by Jack Smith. Substitution, AFC Wimbledon. George Oakley replaces Adebayo Azeez. Adam Barrett (AFC Wimbledon) wins a free kick in the attacking half. Andrew Whing (Oxford United) is shown the yellow card. Corner, AFC Wimbledon. Conceded by Joe Riley. Tyrone Barnett (Oxford United) wins a free kick in the defensive half. Attempt missed. Joe Riley (Oxford United) right footed shot from outside the box misses to the right. Substitution, Oxford United. Callum O'Dowda replaces Brian Howard. Corner, Oxford United. Conceded by Alan Bennett. Attempt missed. Danny Hylton (Oxford United) right footed shot from the centre of the box is close, but misses to the left. Substitution, Oxford United. Tyrone Barnett replaces James Roberts because of an injury. Brian Howard (Oxford United) wins a free kick in the defensive half. Foul by Jack Smith (AFC Wimbledon). Attempt missed. Adebayo Akinfenwa (AFC Wimbledon) right footed shot from outside the box is close, but misses to the right. Barry Fuller (AFC Wimbledon) wins a free kick in the attacking half. Attempt missed. 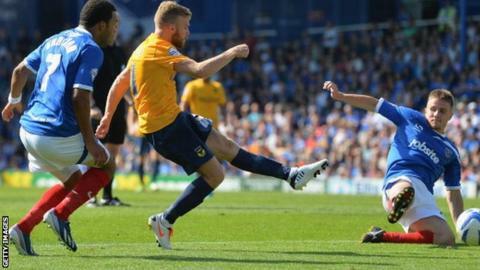 Danny Hylton (Oxford United) right footed shot from the right side of the box is close, but misses to the left.